You should never go hungry on Farmington Avenue. The corridor has two dozen restaurants offering food for all tastes and budgets. Many deliver to your door. Chinese restaurants and pizza shops are plentiful. But no two pizza shops are alike. City Pizza offers kosher meat toppings and specialty pizzas such as white clam pizza or white pie with fresh mozzarella, Romano cheese, garlic, parsley, oregano and olive oil. A-1 Pizza is a favorite in Asylum Hill. Other pizza restaurants are Sgt. Pepperoni, Whitney and Domino's. The avenue’s four Chinese restaurants have similar menus but each has their own recipe for preparing the same dish. You’ll just have to experiment to find the flavor you prefer. But the avenue’s real culinary treasure is the growing number of ethnic restaurants and watering holes, mostly run by families and young entrepreneurs. Two feature Spanish cuisine, Monte Alban in the West End and Munchies in Asylum Hill. Both are family run and offer large portions at moderate prices. Décor is colorful and it’s helpful to know a little Spanish to interpret the menu and order dishes. Monte Alban features Mexican food while Munchies menu has Colombian cuisine. On Monte Alban’s menu are seven varieties of tacos, burritos, tamales, tostadas, enchiladas, quesadilla – foods you’d expect at a traditional Mexican restaurant. But diners should stray from the better known dishes and try the tortilla soup, tilapia fish, pozole and house specialties. Columbian restaurant Munchies offers hearty meat dishes prepared in 24 different ways, often complemented with ice, frijoles, yucca, papa and green plantains. 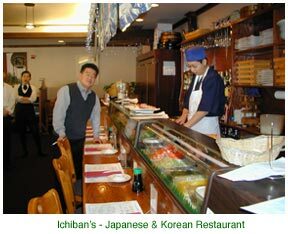 If you’re in the mood for sushi, Ichiban’s is the place to go. The restaurant opened up a few years back in a former Friendly Ice Cream Shop. Owner Sam Oh did a remarkable job renovating the building by removing Friendly’s signature red décor and converting the former soda fountain seating into a prep area. Island Cuisine, a West Indian take-out restaurant in Asylum Hill, has authentic Jamaican dishes. Run by three brothers and their sister, it does a brisk business at lunch time as people are drawn to its affordable and delicious luncheon specials. On the menu are oxtail, curry goat, jerk chicken, escoveitch fish, callaloo, stew peas, totoes and gizzadas and more. Irish pub food can be eaten at the Half Door. It serves hearty portions of traditional Irish foods – shepherds pie, Guinness lamb stew, cottage pie – and a large assortment of sandwiches. The Half Door has over 100 varieties of beer; most of them are imported. The pub has live music on Wednesday, Friday and Saturday evenings, ranging from a one-man balladeer of Irish tunes to a 7-piece rock band. 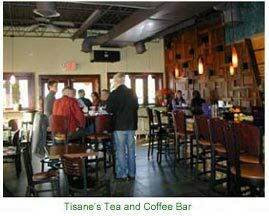 Another active night spot is Tisane’s Tea and Coffee Bar. By day, this comfortably furnished coffee house with fireplace, seems to attract people who linger. At night Tisanes gets a livelier crowd. In warm weather their front patio is packed into the wee hours of the morning. It has just expanded its kitchen so it can have a menu beyond baked goods and sandwiches. Also adding to the West End night scene is Braza, a Churrascaria (Brazilian steak house) restaurant where 14 different meats are served on skewers at your table. The meats will keep coming until you say "enough!" Vegetarians are offered a full salad bar including rice, beans and fish. Some nights the restaurant has Latin music and dancing. Mornings. Where can you find eggs and a good cup of coffee? Mo's has been voted the best breakfast spot in Greater Hartford so many times that people line up outside the front door every weekend waiting for a seat to open up.